Gray rock is located right outside the town of Crozet. It is a neighborhood that provides urban and rural environments. The town of Crozet is filled with resturants , peach orchards, and vineyards. The neighborhood is surrounded but beautiful Blue Ridge Mountains features 360 mountain views. No matter which direction you are looking there is always a wonderful view. Crozet is a very safe and welcoming town. This town has everything you will ever need. 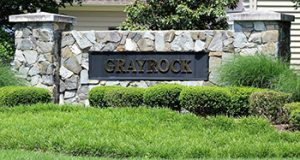 Homes in Grayrock start in the $300’s and range upt to $500,000. Most are two story colonial style homes.